Suit up monkey’s, its time once again to protect your precious hides with a cold, hard second skin we call armor. Anyone who’s anyone looks better in armor. Iron plates cast to ones magnificent shape, held together with bits of leather. Maybe you prefer “chainmail”, tough interlocking iron rings that lie snugly over ones physique. Glorious shields and lethal swords bring this look to the top of the “must haves” 2014 armor collection. Of course not everyone has the strength to adorn the armor of yesterday. For those monkeys the trendy ballistic vests, flak jackets, or the hot new Dragon skin body armor may be just the ticket! 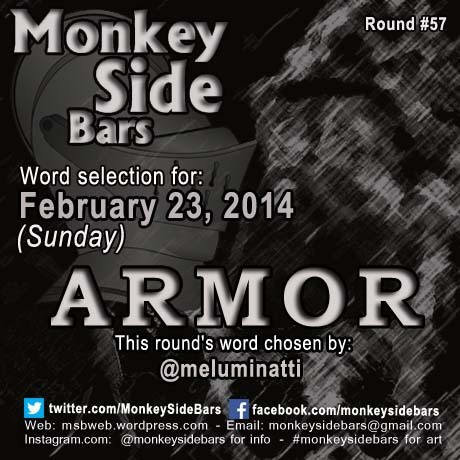 No judgement, no worries, just suit up and ready yourselves for armor Sunday, February 23rd. I’m a little rusty… run that by me again 😀 I’ll suit up. Love it Tracy.